I’m not quite sure how, but for some reason I managed to completely miss out on the legend that is the 2000AD comic. I really don’t know why I never got into it, as it was all about spaceships and aliens and that kind of thing, so I should have loved it. The best excuse I can think of is that when I used to buy comics I somehow thought that 2000AD was for much older kids, and by the time I was that age comics had lost their appeal to me as I was heavily into computer magazines. I was first introduced to 2000AD by some school friends, who were talking about a character named Judge Dredd, surely the most well known name to have come from the comic’s pages. What they were describing just didn’t sound like it should be a comic book, as I expected comic books to be full of either slapstick comedy or superheroes in the Superman or Batman mould. 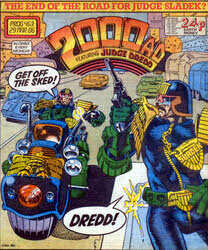 I couldn’t work out from what my mates said whether Judge Dredd was supposed to be a hero or a villain. He was supposed to be a policeman, judge and jury all rolled into one, but given some of his actions he didn’t sound particularly lawful at times. However, given the state of things in Mega-City One, his kind of justice was probably a necessity – I certainly wouldn’t want to live there! Interesting though it sounded I still wasn’t tempted to get a copy of the comic myself, simply because I didn’t realise there was way more to 2000AD than just Judge Dredd. 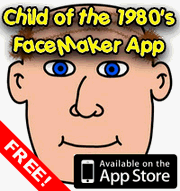 Over the years it has seen a great variety of comic strips written and drawn by some of today’s best known comic book authors. I’m not a big comic fan, but I have heard of Neil Gaiman and Grant Morrison, who were just two of the many. These gobstopper style sweets were lethal in many ways, but they did represent good value for money as you got three in a packet and they lasted ages! In no particular order here are the reasons why you had to be careful eating them. Lethality 1: They truly deserved the name Fireball as they made your tongue start to burn not long after popping one in your mouth. I’m not sure what the ingredient was that made them so hot, but hot they most certainly were. 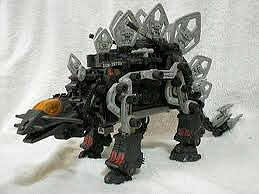 Lethality 2: These guys were also pretty big, at least for the average child sized mouth anyway. You could just be a baby and lick at them I suppose, but that would take forever to eat and what is the fun in that. No, you had to pop them into your mouth whole, moving them around to relieve your burning tongue and forever sucking to stop bucket loads of saliva dripping down your chin. 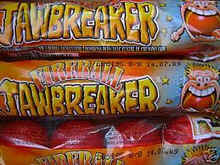 Lethality 3: As the name Jawbreaker suggests these sweets were also incredibly hard to bite into, but because there was a piece of bubble gum lurking in the centre of them you just couldn’t help but try to bite into them every so often. These sweets must have caused many an emergency dentist visit. Lethality 4: Finally, as if the danger to your teeth wasn’t already bad enough, the fact they were sat in your mouth for so long generating sugary sweet spit meant that you probably weren’t helping your chances of avoiding a few more fillings. They are still available today, as are their more tongue (but not tooth) friendly fruity flavoured cousins. 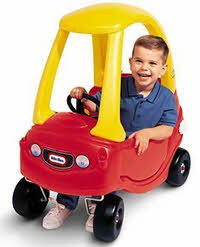 Todays choice of TV advert is one of those ones which has just stuck in my head for some reason due to the song in it. I may not be able to play an instrument or have a good singing voice, but I’m sure I’m not alone in finding that certain pieces of music just seem to lodge in my mind. 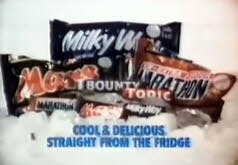 The advert in question is one for chocolate bars manufactured by Mars, including Milky Way, Marathon (yep, we hadn’t gone all global at this point), Bounty, Topic (they’re getting increasingly more difficult to find, and have disappeared entirely from the Celebrations mini chocs I believe) and of course the good old Mars bar itself. Cue several million hands slapping their owners foreheads. “Why didn’t we think of that!, we chorus. So we march to the shops, buy up all the chocolate bars we can get our hands on and stuff them into the fridge, grinning wildly as we think about the lovely chocolatey goodness to come. With the Super Mario videogames proving so popular, it was inevitable that Mario would sooner or later receive his own animated TV show, and sure enough in 1989 it happened. In actual fact he had more than one show, but the one I remember most was the Super Mario Bros Super Show. As I recall it was shown in the UK at the end of TV-am at the weekends (though I might be wrong about that) and it was kind of unusual for a cartoon show because it also featured a couple of live action sections at the beginning and the end. 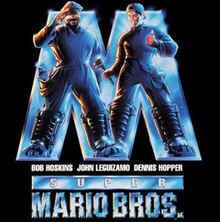 The cartoon itself was pretty much what you would expect, with Mario and Luigi having to rescue Peach from Bowser in many episodes, all set for the most part in a version of the Mushroom Kingdom not dissimilar to that from the games. The live action section is what I remember most about the show though, if only because it was cheesier than a 12 pound chunk of cheddar. 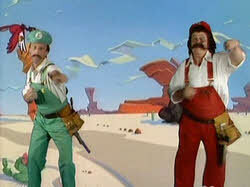 It featured Mario and Luigi running their plumbing business in Brooklyn, and was basically a bunch of corny sketches which normally bore little in the way of links to the cartoon segment.